The Titanic and the Californian. Two very different ships. One a luxury ocean liner; the other a freighter. One a massive ship 1/6th of a mile long; the other less than 500 feet long. Not much would connect them, you would think, and you would be right. Except for one thing. Their close proximity to each during the greatest peace time disaster at sea of the time. Much has been written and much anger and emotion have been spent on both sides of the argument: did the Californian see the Titanic and its rockets (a theory endorsed by the British and US Enquiries), or were they too far apart, each ship seeing a mysterious - and to this day, unidentified "mystery ship"? Both sides are guilty of ignoring evidence and testimony that contradicts their chosen theory, hence this page. Now, hopefully we can, perhaps for the first time, compare side by side exactly what was going on each ship during the catastrophe, and what people saw and said. The boat deck of the Titanic, not normally associated with activity at midnight, demonstrated an unusual level of activity as the crew started pulling covers off the lifeboats and prepared to abandon ship...or at least, to allow some of the 2200 people on board to abandon ship. Word had started to spread about a ship's lights seen almost directly ahead. Certainly Fleet and Lee has seen nothing before and after the collision; and the former said that his relief has reported them. As more and more passengers arrived on the boatdeck, the conversations speculated on the cause of this most inconvenient of lifeboat drills. Some people had heard of ice, and some had heard of the stranger in the vicinity: Mrs.Thayer, whilst on the forward boatdeck, saw a ship about a mile away headed in the opposite direction to the Titanic. Colonel Gracie, woken at midnight heard the blowing off of steam from the Titanic\92s funnels. He went to A-deck and looked for any indication as to what had happened. A few minutes later, after hurriedly packing his belongings in his cabin and returning to deck, he happened to meet Mrs.Appleton, Mrs.Cornell, Mrs.Browne, Miss Evans and presently Colonel Astor. To reassure them, Gracie leaned through the window and pointed out the light in the distance, about 6 miles ahead toward the bow. Boxhall was one of those clearing away the lifeboats, following his watch on the bridge during which the fatal collision had occurred; he unlaced the covers on the port, and then the starboard side boats. He too had heard of a light seen off the bow and wanted to see this stranger for himself. However, before he did so, Boxhall attended to another of his duties: ascertaining the position of the ship from the navigational data collected during the evening. After working out the now famous (and incorrect) position of 41o46\92N, 50o14\92W, Captain Smith ordered him to take it to the wireless room. When Boxhall arrived there the noise of steam being released was so loud that, he wrote the position on a piece of paper and left it on the table for the operators, Philips and Bride. Comment: Boxhall\92s revised CQD position was picked up, according to the British Inquiry, at 10.45pm New York Time/12:35am Titanic time by the Cunard rescue ship Carpathia, and at the same time by Cape Race. However, at the British Enquiry, Cottam, the wireless operator of the Carpathia puts this at 10.45pm New York Time, 12:35 Carpathia time, and reference is made by counsel to a \93corrected PV\94 (Process Verbal = wireless log). According to http://titanic.gov.ns.ca/wireless.html, Cape Race heard this new position at 10.35pm. After returning from the wireless cabin, Boxhall\92s attention was mostly focussed on the ship seen about half a point off the port bow and about 5 miles away; he could see her masthead lights, which had opened slightly, as if she was approaching the Titanic: the red light was too far away to be visible at the point. She seemed to be a 3 or 4 masted ship. The Captain was standing near to Boxhall and could see the other ship as the 4th officer used the Morse Lamp to try and establish contact with the stranger, flashing \93Come at once, we are sinking\94. The strange ship seemed to come closer, but the faint flashing seen in return, which was thought to be a Morse reply, was just the masthead light flickering. 8 bells sounded; the notification for 2nd Officer Stone to relieve 3rd Officer Groves for the 12-4am Middle Watch on the stationary freighter Californian. As Stone went up to the bridge, he was stopped by Captain Lord at the wheelhouse door, who updated him on events in the last few hours. He showed his 2nd Officer the loose field ice that surrounded the ship, and a dense icefield to the southward. Lord pointed out a stopped steamer a little abaft of the Californian's starboard beam (SSE by the standard compass) and gave orders that he was be to notified if she changed bearings or if she moved any closer. Lord mentioned that Groves had already tried to contact the other ship by morse lamp without any success. To Stone, the other ship was a small tramp steamer about 5 miles away: she was showing one masthead light, a red sidelight and two or three small indistinct lights, possibly portholes or open doors, and heading in the same direction as the Californian (North East). His orders given, Lord left Stone to commence his watch on the bridge, where he met Groves at 12.08am. Groves repeated Lord's information, adding that the Californian was swinging, and the other ship, evidently a passenger steamer, had stopped as one bell had struck (11.40pm) to call the Middle Watch, putting her lights out at the time she stopped. A check of the compass verified Grove's information that the Californian had stopped heading ENE. At this time, the other ship was dead abeam and, as Groves left, Stone attempted to signal her with the Morse lamp, but no reply was forthcoming. At about 12.15am, Apprentice Gibson joined Stone on the bridge. About five minutes later, as the two were drinking coffee, Gibson asked if there were any ships in the vicinity. Stone informed him of the mysterious stranger, and Gibson looked over the weather cloth and saw the ship, which he reckoned to be between 4 and 7 miles away. A flickering white light seemed to indicate a Morse light signalling, so Gibson went over to the keyboard and gave one long flash in answer, and still seeing this light flickering, gave her the calling up sign. The light on the other ship, however, was still the same; raising his binoculars, he studied the darkened stranger. He realised that it was her masthead light flickering: and, he could also see her port sidelight and a faint glare of lights on her afterdeck, although the red port light was too small to be seen with the naked eye. To Gibson it was as if the stranger was heading to the northward of NNW, showing its port side. To the two men on the bridge, the other ship seemed to be a tramp steamer, with Stone adding that she was burning oil lamps. At 12.25, Gibson left the bridge to prepare a log line when steaming resumed later that day. Ten minutes later, Captain Lord whistled up the speaking tube and asked if the other steamer had moved. Stone replied "No" and that she was still on the same bearing. At about this time, Gibson temporarily returned to the bridge and reported that he could not find the log and whether Stone knew anything about it. 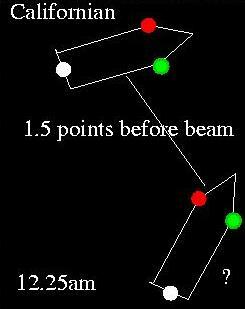 Gibson noticed that the other ship was about one and a half points before the beam before heading back down again. Quatermaster Rowe, on the poop, had been waiting patiently for orders since he saw the iceberg brush by at 11.40. He was surprised to notice a lifeboat launched on the starboard beam at 12.25. He telephoned the bridge and got Boxhall, who was putting the firing lanyard inside the wheel-house after sending off a rocket: the 4th Officer was surprised as he didn\92t even know the order has been given to fill the lifeboats. Rowe asked him if he knew that a boat had been launched. Boxhall replied \93No, is there?\94 and asked if he was speaking to the third officer. Rowe replied that he was the Quatermaster, and Boxhall told him to bring detonators for the distress signals to the bridge. Quatermaster Bright had by now joined Rowe and they each brought a box of detonators to the forward bridge. Comment: at the British Inquiry, Rowe thought it was boat 13 or 15 that had been launched. He also noted that the Titanic\92s stern was swinging and was practically dead south at that time. He didn\92t seem to notice that a rocket, or rockets had started to be sent up, but he did notice the immense roar of exhausted steam from the funnels: he also noted that there were rockets stored at the fore and aft bridge. Informing Captain Smith that some rockets had been called for, the master instructed Boxhall to carry on. The lowering of the boats was underway now. 3rd Officer Pitman in Boat 5 was lowered just before the rockets started firing. The perilous situation was now starting to become evident to the people onboard as the ship was already 15-20 feet down at the bows. Rowing off, Pitman eventually found himself 4-500 yards from the ship. 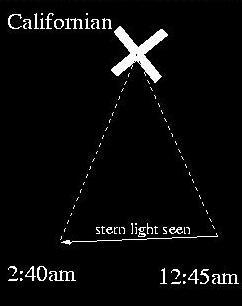 While lying on the oars, the motionless bright light (stern light as he said later) which he thought was about 3-5 miles away, was seen and Pitman said to the others, \93There is no use in pulling toward it until we know what it is." The occupants saw the light, but he said, "What is the use of pulling to it?" It might have been one of our own boats with a white light on it.\94 He had not seen the light before the ship was launched. Boat 5 ended up off the starboard side with No.7, about abreast of the mainmast, on the starboard quarter. Comment: Jewell notes that, at 1.50, the forecastle head was close to the water. Jewell was in boat 7. At the US Inquiry, Pitman described the other ship as being right on the course of the Titanic \93to the westward. Right ahead-\93, indicating that Pitman believed that the Titanic was still heading west. At the British Inquiry, Pitman said that he was 100 yards from the sipi initially, and 200 yards away when she foundered, as he had been asked to stand by to come along the after gangway door when hailed. Pitman also recalled that the Titanic was stationary after he left the ship and not altering her heading, which contradicts Rowe\92s \93swinging\94 statement. To be fair, it should be noted that Pitman failed to notice the Titanic breaking apart as she went under. Rowe handed the detonators to Boxhall and he resumed firing rockets from the starboard side. They rushed upwards with a tremendous bang, reaching 600 to 800 feet before exploding, sending a cascade of white stars showering down. Rowe too could see the light, just a little on the port bow, half a point away, as he assisted Boxhall. At about this time, Boat 3 was being launched, and rowed for the single bright light on the starboard bow, about 2-3 miles away. By the time that Titanic sank, boat 3 was a quarter of a mile away, and by the time daylight arrived, they could not see a thing of the light then. Mrs.Spedden, in boat 3, wrote in a diary entry dated April 15, 12.30am, that "our men rowed on after a light on the horizon". 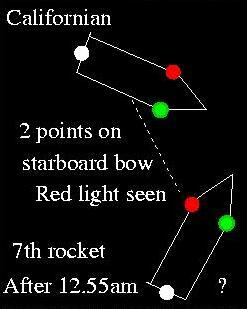 She also notes that two of the four oars were lost over the side, and that the shooting stars on the horizon deceived them into thinking they were the lights of a ship. 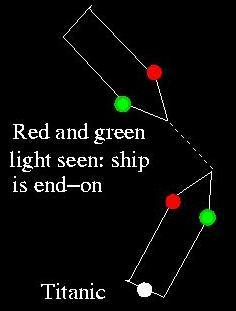 Boxhall continued sending up rockets, and noticed her green and red lights, as if the ship was end-on to him. As Boat 6 was being prepared for lowering, 2nd Officer Lightoller gave instructions for the crew to row for the light on the port bow. Lightoller had judged this single light to be 3-5 miles away, 2 points on the port bow. Although he only observed it for half an hour, to Lightoller, the light was stationary. Fleet too had observed this single bright white light shortly before he entered boat 6, 4 points on the port bow, and like the other people on board, set off for it, ultimately with no result, probably because only two people were rowing, and also because he thought that it was "getting away from us all the time" and "She was getting away off" and had disappeared by daybreak (although he did confusing remark that "It did not seem to be moving at all". ): initially they rowed to escape the assumed suction from the Titanic in the direction of the light and got about a mile away, stopping for a quarter of an hour until they pulled for the Carpathia's lights which had hove to. Major Peuchen, also in boat 6, stated later that Quatermaster Hichens \93imagined\94 he saw a light; in the Major\92s eyes, they were a reflection. The lifeboat had started off from the Titanic\92s port side, straight off from her about amidships, on the port side, right directly north, as the Northern Lights appeared in the same direction shortly afterwards. To Hichens, the light was moving, gradually disappearing. 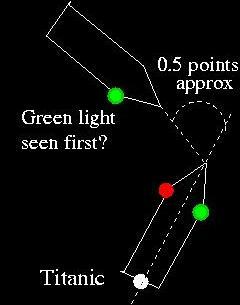 Mrs. Smith thought that the light was a star, but noted that others in the boat thought they saw two lights. \93Molly\94 Brown was under no such illusion. She told afterwards about her boat pulled vigourously towards a faintly glimmering light on the horizon, but, after three hours of pulling, the lights grew fainter and then completely disappeared. Whilst in boat 9, Wynn saw lights 7 or 8 miles away. He saw a red and a white light, and then the red and white disappeared leaving just the white one. After the light disappeared, he saw the white one about 10 or 15 minutes afterwards in the same direction. To quell panic, the occupants of boat 10 were told that the strange ship was coming to their assistance. The boat pulled away from the ship and was 250 yards away when the Titanic went down. However, its mobility was hindered by only having two people rowing. They could still see the 2 masthead lights of the strange ship off the port bow apparently coming nearer, heading towards them bow-on, 3 miles away, and decided to row for it. After seeing the ship head-on, the ship stopped, was stationary for three hours, then she \93made tracks\94, the lights seeming to go right by, with nothing to be seen of her in the morning. Comment: despite Buley saying that that \93there was a ship of some description there when she struck, and she passed by us\94, Buley was below decks at the time of the collision. Buley also noted that the port light was under water, whilst Evans says it was 10 feet above: evidence indicates that the lights didn\92t go underwater until a few minutes before the actual sinking. Buley\92s incredible claims about his eyesight must be treated with caution too! Stone was left to pace the bridge and, at 12.45am was suddenly attracted to a flash of light in the sky above the steamer. He thought nothing about it at the time, as he had seen several shooting stars that night. He raised his binoculars and saw another "flash" and stars streaming away from the explosion, which he recognised as a rocket, detonating over the other ship. Stone observed no flash on the deck or any indication that it had come from that steamer; in fact, it appeared to come from a good distance beyond her. Comment: It is thought that one of the \93extra\94 Californian crew members, summoned to the British Enquiry but who never testified (and as mentioned in Leslie Reade\92s book) alerted the OOW (Stone) of the rockets being sent up. At this time, the other ship had started to steam away, altering her bearings towards the south west and showing various lights, which he took to be alleyways, the engine room skylight and the stern light, which he took to be the brightest light observable on the other ship. 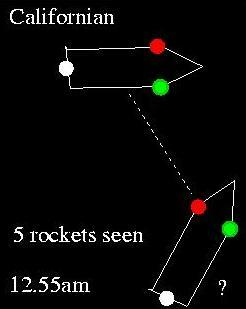 Between then and about 1:15 Stone observed three more rockets, all white in colour, fired at intervals at about 3 or 4 minutes. Once he was sure that he was seeing rockets and not just shooting stars, he immediately whistled down the speaking tube, rousing the Captain in the chartroom. Stone reported the white rockets. Lord ordered that the Morse lamp should be used to try and get some information from her. Lord asked whether they were private signals, to which Stone replied, "I do not know, but they were all white." "When you get an answer let me know by Gibson." Lord replied, as he went back to sleep on the settee. As Stone said later, "Naturally, the first thought that crossed my mind was that the ship might be in trouble, but subsequent events showed that the ship steamed away from us; there was nothing to confirm that; there was nothing to confirm that the rockets came from that ship, in the direction of that ship," and that, after the Captain's query about company signals, the thought of distress never occurred to him. Indeed, as he said later "A ship that is in distress does not steam away from you." As he continued firing rockets, eventually Boxhall could see the other ship\92s green sidelight with the naked eye, and then turning to show the stricken liner her red sidelight. He could see the red light with the naked eye, which he saw most of the time. The other ship did not seem to be steaming very much. Comment: I am unsure as to how many Lowe refers to when he says \93incessantly\94. 2 or 3? 4 or more? Hendrickson, assigned to boat 1, saw a bright white light 5 or 6 miles ahead of the ship whilst still on board. His fellow boat mate, Symons had noticed a list to port that enabled the lifeboat to clear the side of the Titanic. By this time, the forecastle head of the Titanic was awash. Comment: At the British Enquiry, Symons noted that the ports under Titanic\92s name were awash as Boat 1 pulled away. While in the water, Symons took more notice of a single light 1 \BD points on the port bow, about 5-10 miles away. He could still see it when he reached the water, but had first noticed it after boat 3 had been sent away. Boat 1 rowed for the light, bearing roughly on the lifeboats port beam after pulling 200 yards away from the Titanic. But the light disappeared, gradually going away from him. They eventually got a \BC mile away from the Titanic (Hendrickson says 200 yards when the ship foundered). Back on the ship, Boxhall had to usher people away from the detonations; after boat 1 had left, he fired a rocket. At this time, Rowe was also assisting with the rockets and Morse Lamps. Comment: At the British Enquiry, Boxhall stated that he fired one or two rockets after Boat 1 had gone. Boat 11 had left the ship\92s side too, and got about 300 yards away. The occupants also pulled for a light for two hours but did not seem to get any closer, and they lost sight of it. Mackay thought it was a stern light \BC mile away on the starboard side, even though it was \93reddish\94 (indicating a port light). He thought it was going the same way as the Titanic. Lookout Lee, in boat 13, watched the rockets ascend and burst as their boat was lowered and rowed away into the night. 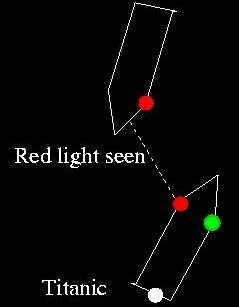 Lawrence Beesley also saw a ship\92s lights immediately after leaving the ship; they were on the port side on the horizon, one light above the other. Boat 13 rowed in their direction for a time but the lights disappeared below the horizon. Washington Dodge might also have seen the light. He said that, together with 2 or 3 other boats in the vicinity, they endeavoured to overtake the lifeboat which showed the light, which was \BC mile distant, but they never able to approach it \93although [we] must have rowed a mile\94. Perhaps this may be because, as Dodge noted, the oarsmen were \93poor\94. Steward Hart had, in the meantime, arrived on the boat deck and seeing what he thought was the last starboard side (15), he ushered himself and his charges aboard. 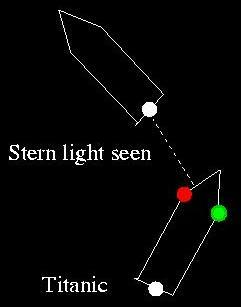 He had seen two masthead lights, but he had seen them on the starboard side of the Titanic, bearing North. He could still the lights as he was lowered to the sea, rockets exploding uselessly overhead. At about the same time, boat 16 was launched and pulled away \BC mile before resting. They saw the light and pulled for it, and then after half an hour, they saw the Carpathia\92s side lights. It was about 1.25am now (according to Rowe), and collapsible C was being prepared for launch: the uncommunicative and unhelpful ship was now 2 points off the port bow. Rowe asked the Captain if he should fire any more rockets, but Chief Officer Wilde needed an officer for the boat and Rowe was ordered aboard. As the boat pulled away, the Titanic\92s well deck was awash but the forecastle head was not yet submerged. After reaching the water, they rowed dead ahead for \BE mile for the light, 5 miles away but could get no closer and turned towards a boat that was carrying a green light (Boxhall\92s \96 No.4). The other ship seen off the Titanic\92s bows was stationary, showing a stern light (but no sidelights). However, according to the people on board the boat, towards daylight she \93hauled off\94 and was not seen again. Ismay, also in C, but with his back to the Titanic, helped to row for the light, which was \93a long way away\94 on the starboard side of the ship. To him, the light disappeared when daylight came; but they had given up by then as the wind had come up and the sea had become choppy, and no progress was being made at all. By about 12.55, Gibson had rejoined Stone on the bridge, and the Apprentice was updated with the latest orders from Lord. By this time, the other ship was 3 1/2 points on the starboard bow (or 2 1/2 points before the beam as he said at the British Inquiry), and Gibson, who had missed the first five rockets, went at once to the Morse lamp and called up the ship continually for three minutes, with no success. Gibson had just got his binoculars focussed on the ship when he observed a white flash, apparently on her deck, followed by a faint streak towards the sky which burst into white stars. When about two points on the starboard bow, another rocket was fired. At about 1.20am, Stone remarked that the other ship was slowly steaming away towards the south-west. The Second Officer remarked to Gibson, "Look at her now; she looks very queer out of the water; her lights look queer." Using his binoculars, Gibson agreed and that the ship seemed to have a big side out of the water, or a heavy list to Starboard, as the sidelight was higher out of the water than it had been previously. Conversely, Stone "took it to be due to the fact that very likely she was porting for some iceberg close at hand and was coming back on her course again, showing her other lights, the original lights." The masthead light was shut in, apart from a slight flickering, and the only lights he could see was the stern light and the end of an alleyway or engine room skylight. Stone ventured that "A ship is not going to fire rockets at sea for nothing", and Gibson agreed, thinking that everything was not all right with her. The Apprentice had also noticed that the red sidelight had disappeared, and her masthead light was just visible; however, he didn't see any stern light at all. Between one point on the starboard bow and one point on the port bow Gibson called her up on the Morse lamp but again, received no answer. At 1.40am, when about one point on the Port bow the other ship fired the final rocket. A total of 8 had been seen. To Stone, the rockets seemed to come from a greater distance past the ship: the rockets did not appear to go very high and were very low lying, reaching only about half the height of the steamer's masthead light. To his mind, they should reach a greater altitude, but he realised that the origin of the rockets was indeed the other ship because the rocket's bearings changed as the other ship's bearings changed. His attempts to summon help ineffectual, Boxhall was ordered into boat 2 by the Captain. He had fired between half a dozen and a dozen rockets; probably about eight in total. The other ship had turned around very, very slowly and was now only showing a single bright light, which Boxhall interpreted as the stern light. He could no longer see anything of the masthead lights. He pulled 100 feet away from the ship\92s side with his load. Hearing a cry from the Titanic to \93come round to the starboard side\94, Boat 2 ended up pulling around the ship\92s stern with the intention of getting alongside the ship, keeping about a hundred yards (or 200 feet \96 Br.Inq.) away. Boat 2 was \BD - 3/4s of a mile from the ship went she sank. By the time Boxhall had rounded the stern, he could no longer see the light. Another member of Boxhall\92s boat thought that the Titanic was listing too far to starboard to make a viable attempt to get close to the ship; Boxhall, on the other hand, aborted the plan due to the suction that he felt. Comment: At the US Enquiry, Boxhall was asked if the ship had come in the same direction as she had come, and Boxhall agreed, saying \93in a westerly direction\94, indicating that he believed that the Titanic was still heading westward. At the British Enquiry, he noted that he was 200 feet from the ship, a little abaft of the starboard beam of the Titanic, before pulling away in a North-Easterly direction. again. Burton, again at the British Enquiry thought that it was a masthead light belonging to a ship that sailed \93right away\94. The ship had a large list to starboard at this time. Meanwhile, next door, Boat 4 still hung in the davits, with a crowd of women passengers impatient to embark. As it reached the ocean, now less than 60 feet below, Mrs Thayer was disappointed to learn that the ship\92s lights that she had seen shortly after midnight had disappeared. At that time, A deck was only 20 feet from the sea, and D deck was submerging. Collapsible D, the last boat to be launched from the portside, got as far as 150 yards, with four people on the oars, before the Titanic sank. Lucas saw a faint, red sidelight and a white light \96 broad on the Titanic\92s starboard side, \93from her quarter\94, 8 or 9 miles away right on the horizon. The light went further away every time he looked at it but he only saw her when he was in the water. 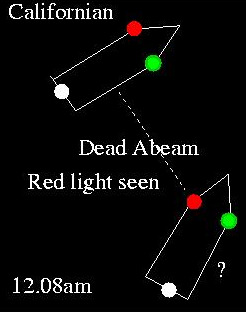 In the same boat, QM Bright had seen the white light (4-5 miles away), off the port bow, and they pulled for them. He related that the light seemed to disappear all at once, just before daylight. Comment: Lucas seemed to be referring to a different light altogether, as \93the other man\94 (?) 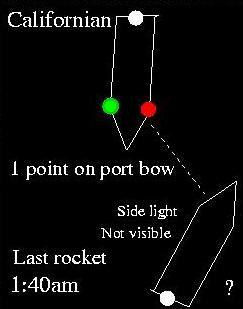 talked of two points on the port bow. Bright talks about only having two oars pulling, which could indicate that they didn\92t travel very far in the water towards the mystery ship. At about this time (2.00am), Lowe, in Boat 14 had rounded up boats 4, 10, 12 and D, and, in a statement that he made at rhe British Consulate General in New York, he said that, at this time, he could still the same red and white lights in the same position as he had while preparing Boat 1 for launch. Lowe's statement is not yet in the public domain, but the rest of the document, from information I have obtained, contradicts this "late" sighting. Shortly afterwards, while attempting to launch the last two collapsible boats, the Titanic\92s bridge plunged beneath the sea, and at 2.20am, Titanic, \93The Queen of the Ocean\94, split in two and plunged to the bottom of the North Atlantic taking 1500 people with her. At 1.50am, the Californian was heading WSW, and the other ship was SWxW, according to Stone, who was busy observing the other ship through binoculars and constantly taking bearings of her. Stone had also lost sight of her red sidelight too. The stern light was gradually fading as if the steamer was steaming away from the Californian, and by 2.00am, this was the only thing that could be seen of her, bearing SW 1/2 W, or, according to Gibson, 2 points on the port bow. Comment: SWxW is 236o15' (or S 56.25 W), and SW 1/2 W is roughly S 50 W.
At 1.50, according to Stone, the Californian was heading WSW, and the other steamer was about SWxW, which would put it 11.25 degrees off the port bow, or 1 point. Gibson saw the last rocket fired when the ship was one point on the port bow, about 10 minutes earlier. Although Gibson only made note of bearings relative to the Californian's beam and head, this correspondence between the two is striking. 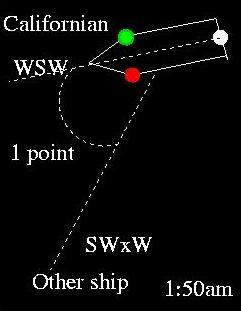 Comment: Again, at 2.00am, Stone saw the other ship at SW 1/2 W, or 17.5 degrees off the port bow; similar to Gibson's "two points", or 22.5 degrees. To Gibson, the other ship had gone by 2.05am, and as per the Captain's instructions, Stone sent him below to report to the master, telling him that altogether eight white rockets had been seen, that the Californian was heading WSW and the other ship had gone out of sight to the SW. Lord asked if the rockets were all white and whether there were any colours in them at all. Gibson replied "no". Lord asked Gibson what the time was and he replied, "Five minutes past two by the wheelhouse clock". As Gibson shut the door, the Captain said something to him, but he didn't hear what. Stone was sure that could still see the stern light 20 minutes after that and at 2.40 by means of the whistle tube. he blew down again to, the captain; he came and answered it, and asked what it was. Stone repeated that the ship had disappeared, bearing S.W. to half W and that the rockets were all white. By this time, Stone reckoned that the other ship had been 2 points on his port bow. Above: 2nd Officer Stone's interpretation of the situation. For more on this subject, see here.